Looking to congratulate someone on their graduation or job promotion? A leather padfolio is your best bet. 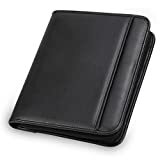 Whether it’s for office, home or business use, leather padfolios come in handy more so for a busy executive (Source). A padfolio is basically a mix between a wallet and a binder. It is similar to a portfolio only that it’s smaller and lighter. It is an important accessory as it offers you a place to organize all your important documents while having your other accessories such as a tablet, jump drives, business cards among others at the palm of your hand. A padfolio is an essential organization tool. You may not it every day but it is one that when you need it you will have it available, giving you that professional look. A good padfolio is one that not only allows you to organize your papers, but is also strong and styled with minimalistic charisma. In this guide, we will thoroughly review five of the best leather padfolios to purchase. 2.1 Why Buy the Samsill Professional Padfolio? 3.1 Why Buy Wundermax Padfolio? 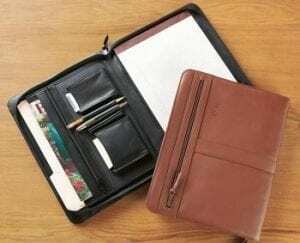 4.1 Why Buy a Lautus Designs Zippered Leather Business Padfolio? 6.1 Why buy a Royce Leather Padfolio? The Samsill leather padfolio is our favorite selection within the price category for padfolios. We have faux leather Samsill that comes in brown, black, and burgundy. You can choose a color that complements your outfit or style, but note that different colors have different price points. Our recommendation for any affordable padfolio is to choose a black color. This is because the quality of a faux leather padfolio just isn’t there to pull off brown. However, if you’re looking for that brown leather look, consider upgrading to genuine leather padfolio at a higher price point. One outstanding feature about all Samsill resume padfolios is the open-style pocket. This is ideal for easily sliding a resume in or out without worrying about creasing corners. Better yet, this version of Samsill padfolios has an optional zipper, which gives it a bit of versatility and perhaps more practical use beyond the interview. 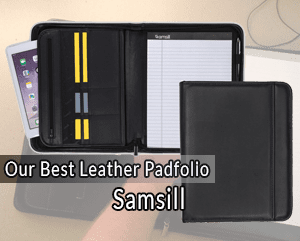 Why Buy the Samsill Professional Padfolio? Multipurpose: Samsill Professional Padfolios are designed and manufactured for all modern-age professionals. Therefore, regardless of your profession, you can have yourself this bonded leather cover that bears the look of genuine leather. Minimalistic design with a contrasting stitching: These padfolios boast a clutter-free and functional design that are unisex. Also, they come in contrasting color schemes. 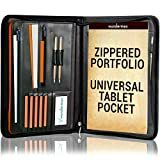 Seamless Organization: A Samsill Professional Padfolio allows you to organize loose pages, letters, envelopes, papers, documents and business cards with much ease. This is due to the internal pockets and compartments. 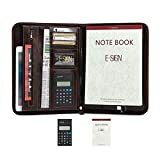 Large interior pocket: This line of padfolios has a large interior pocket that you can use to store your notebooks and other documents of similar sizes. In addition, the pocket can be used as a tablet pocket given that most tablet sizes range from 7.7 inches to 9.7 inches. The Wundermax Padfolio is undeniably in a class of its own. This Padfolio has a storage for everything you would need to carry with you to an office, job interview or a business meeting-just to name a few. What’s more, it is flexible enough to adapt to your unique needs. With a Wundermax Padfolio, you won’t have to worry about losing anything. This padfolio has secure interior pockets as well as a strong exterior zipper to prevent any loose items from falling out. It is reversible hence appropriate for both righties and lefties. Appearance: Wundermax padfolio might appear as a standard PU Leather folio with just a single front pocket. However, as soon as you open it up, you’ll realize the premium design that this padfolio comes with. Instead of vinyl-backed leather, Wundermax uses double stitched leather on both sides. There are several compartments available to store all of your goods, giving a stuffed folio a very professional appearance. In addition, Wundermax gives you the freedom to choose any color you like as long as it’s black. One could argue that this padfolio isn’t something that makes you stand out instantly, but up close you can tell that it’s a premium model. Storage: Based on the research that we conducted, we found out that this padfolio can hold more than most models. The front pocket offers storage for the 8.5 x 11 documents. On opening it up, you’ll find more slots, where you can store your tablet up to 10.1 inches and any other document. Versatility: This padfolio case boasts more pen loops and pockets than standard planners as well as a reversible legal pad to fit right or left-handed people. Durability: When shopping for a padfolio, it is advisable that you get one that will serve you longer. Wundermax Professionals Padfolio is definitely one of the most durable folios on our list. It’s been hand-crafted, made from multiple layers of PU leather that bonds together many times over, using separate pieces to reinforce all of the common wear spots. You can easily attract success by being more organized. A Lautus Designs Zippered Leather Business Padfolio saves you a day’s frustration by offering you enough space to carry everything you need throughout the day in well-organized pockets and compartments for easy and quick access. 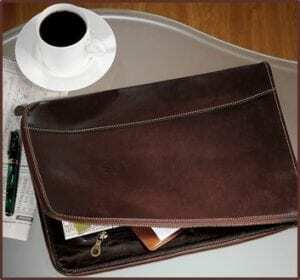 Why Buy a Lautus Designs Zippered Leather Business Padfolio? Professional look: This padfolio complements your general look in a way that one can tell from a distance that you’re indeed a professional. Great gift: Thinking of an ideal gift for your boss? Worry no more, this padfolio comes in a sturdy and elegant gift box. Similarly, it includes a notepad and owner ID card. Warranty: This padfolio comes with a 1-year manufacturer’s warranty guaranteeing it’s free from defects and in case of any then you can always get a replacement. If you’re looking for a padfolio with a basic and vintage design then IVESIGN PU Leather Business Padfolio is your best bet. It has been fabricated from dark brown leather and has rectangular dimensions of 13.6 x 10 x 1.2 inches. The smoothly curved edges mean it can be comfortably used for multiple applications. Needless to say, you could put business cards, notes, papers, as well as a 10-inch tablet into its intended compartment. 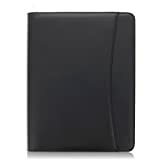 This padfolio weighs about 2.71 pounds and is impressed with a stylish leather PU zipper found on the side of the padfolio, which is used for closing and opening. Its inside has a double compartment system for which you could store 15 credit cards through pocket-sized slots, a notebook, a calculator, a CD, a smartphone or tablet as needed. Royce Leather Shiny Leather Writing Portfolio, Writing Pad, Presentation Fold. This line of padfolio is made with practical budget-conscious aristo bonded leather. It comes in a wide range of colors where you could choose from that will match your personal preference and aesthetic. One important thing about this padfolio is that it can be customized such that you can have it monogrammed or personalized, which makes it a perfect gift for your friends, family, and colleagues. It is not only classy but also very professional that it is perfect to bring to your business meetings, interviews, and any other business errands. Generally, it is an all-purpose carryall writing portfolio as it is designed with several pockets and compartments. This includes a business card pocket, ID card window and other additional pockets. These pockets conveniently store your notes and some documents. Why buy a Royce Leather Padfolio? Exquisite: Finding a padfolio that meets all your professional needs can be a challenging exercise. Royce Leather padfolio is an outstanding product that will perfectly meet your needs. Spacious: Have additional pockets hence you’re able to store more documents and accessories. A padfolio is an important accessory as it speaks volumes about who you are as a person –messy, organized or prepared? So when it’s time get a new padfolio, it is important that you know what to look for. To aid in the search, we came up with four factors to consider when choosing the right padfolio. Manufacturers produce padfolio in different colors. For instance, Samsill produces brown and sleek black padfolios. Regardless of the color you choose, ensure that it is classically stylized folio with an executive appearance. The appearance of a padfolio is determined by the material used. Padfolio made of faux-leather is very soft and smooth to touch. Also, folios made from premium NAPA leather that their look and feel almost perfectly replicated. How long a padfolio will serve you depend on the material it is made from. Folios are made from either Polyurethane (PU) or faux leather, real leather (top grain) or bonded. Real leather is usually sanded to create an even, smooth texture, dyed and a finish coat applied to help it resist stains. Padfolios made from top grain leather offer the best feel along with best color depth and are very durable. Faux leather, on the other hand, is a man-made material that looks and feels like a genuine leather. 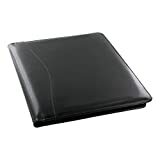 Folios made of faux leather are water resistant and easy to clean. Compared to real leather folios, faux leather folios are fairly durable. On the brighter side, folios made of faux leather bear authentic touch, feel and have an exquisite look, something that is just about perfect for your professional needs. When shopping for a padfolio, storage is one aspect that should not be overlooked. Get a folio that will be able to accommodate all your accessories and documents. Ensure that you get the right size. For instance, a 13 x 10.5-inch folio is able to store standard 8.5 x11 inch sheets of paper and tablets of up to 10.1 inches. It is worth noting that the folio pockets are padded enough to prevent dents or scratches tablet. You don’t have to walk around with worries of your documents or accessories falling out of the folio, and for this reason, it is advisable to get a padfolio that has a zipper. Most folios have a wrap-around zippered enclosure. However, you should ensure that the zipper is attached with an elastic material. This will help keep the folio taut, and thereby preventing the zipper from jamming when opening it. If you’re looking to buy a padfolio, look at your needs, taste, and preference. Regardless of your budget, ensure that you make the right choice. It is our hope that this guide will help you make that choice as all the reviewed products have been tested and proven to be helpful.